It’s hard to say that any one part of the meal was a stand-out, when the menu for a very special dinner we hosted recently included fresh popovers and a red velvet cake. But this was the one that the guests complimented the most–and it was definitely my favourite. 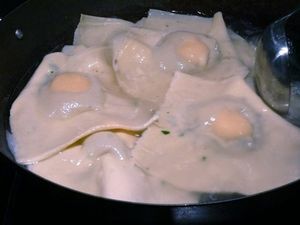 One plate-sized ravioli, filled with a perfectly-cooked, soft, organic egg yolk on a bed of scallion, sautéed spinach. The mushrooms were fried in butter then tossed in more browned butter, and the lemon-spiked leek cream on the side was just tart enough to balance the richness. 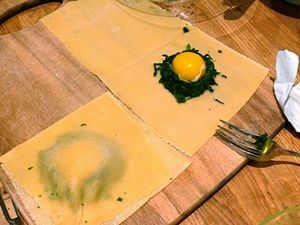 There is some effort involved, but I bet you will think it was worth it once the egg yolk spills out of the fresh pasta and mixes into the butter and cream. Good pasta is important here, but you don’t have to make it from scratch, although we did that night, using a recipe from Lidia Bastianich. While that recipe does not appear here, I highly recommend making your own pasta sheets if you have the time and inclination. But large, store-bought fresh pasta sheets would work well too. I fear dry lasagna noodles wouldn’t work: once boiled, they would stick and be hard to work with, and cooking them to the right doneness before filling them to be boiled again could be tricky. Besides, if you’re going to make a recipe as involved as this, fresh sheets are the only way to go, I think. There is a lot of butter straight ahead. YS note: This recipe has 4 components which are cooked one right after the other. 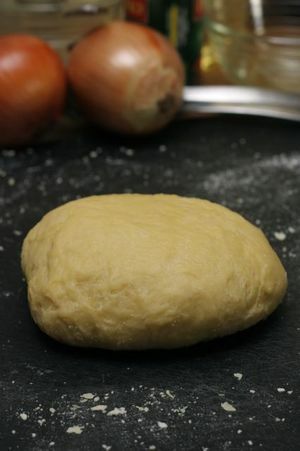 Therefore it’s best to get all of your ingredients for all of the components ready before beginning to cook the first. Make ahead option: Mushroom and butter sauce, leek cream and pasta cutting can be made ahead one hour or two. Lay parchment paper between the pasta sheets and cover with a damp cloth until ready to assemble. Reheat mushroom and butter sauce and leek cream, covered, over low heat prior to boiling ravioli. Heat large wide-bottomed and high-sided skillet or wok over medium high heat. Add the butter and oil to the heated skillet. Add the mushrooms and a sprinkling of salt. Sauté, stirring, frequently, until the mushrooms have browned and any liquid released has evaporated. Season with salt and pepper, mix well and taste. Adjust seasoning as needed. Transfer finished mushrooms to a bowl. If you need to work in batches to avoid overcrowding your skillet with mushrooms, simply divide the 3 tablespoons of butter, the tablespoon of olive oil and the 6 cups of mushrooms as needed. Once all of the mushrooms have been sautéed, seasoned and transferred to a bowl, heat the remaining 125 grams of butter in the same skillet over medium high heat. Simmer and allow the butter to froth and then brown, about 5 minutes. Shut off heat, add the mushrooms back to the skillet, stir into the brown butter sauce, and cover to keep warm until ready to serve. Proceed to making the spinach filling. In a large skillet or wok, heat the butter over medium low heat. Add the scallions and sauté for 2 minutes. Add the spinach salt and pepper and stir to mix well. Sauté, stirring until the spinach has just wilted, about 3 minutes. Squeeze any liquid from the spinach through a fine mesh sieve, discard liquid and set spinach aside until ready to assemble raviolis. Create a workspace and have all of your ingredients ready plus a bowl to catch the egg whites, a bowl to discard the eggshells and a finger bowl of water nearby. Boil water in a large, very wide pan or wok over high heat. Lay a sheet of pasta out lengthwise. 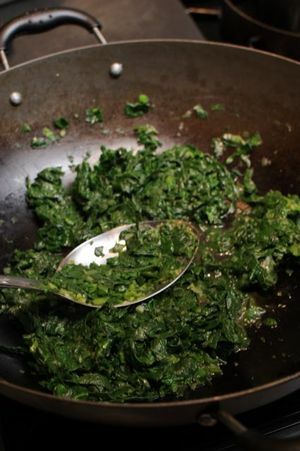 Add a tablespoon of spinach to the centre of one half of the sheet. Make a deep well in the centre for the egg yolk, pushing the spinach up the sides. Carefully crack an egg over a bowl let the whites run off into the bowl. Catch the yolk in your fingers (I like to use my hands here instead of the shell halves, in case the yolk catches on the shell and it breaks) and carefully place the yolk in the spinach well. 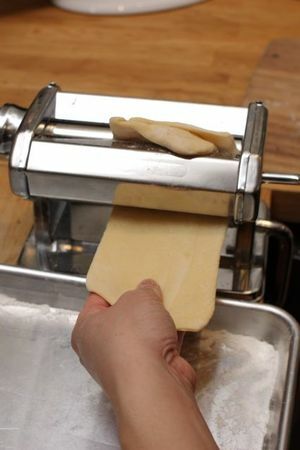 Dip your finger into the water and wet the edges of the pasta sheet all around and crosswise where it will be folded. Fold the empty half over the filling, and press the fold line and the edges together to seal. Repeat with the remaining 5 ravioli and set all on a floured surface or parchment paper. Make the leek sauce before boiling the ravioli as they will only take a couple of minutes to boil. Heat the butter and olive oil in a small pan over medium heat. Add the leeks and half the salt, stir, then lower the heat to low. Sauté until the leeks are softened, stirring occasionally and making sure the leeks don’t brown. Add the remaining salt, cream, and wine. Bring to a low simmer and cook for a few minutes to heat the sauce and allow it to reduce slightly. Then take the pan off the heat and puree the sauce in a blender, small food processor or with an immersion blender until fairly smooth. Add lemon juice and taste. Season with salt and touch more lemon juice if necessary. Return to pan and to a very low heat until the sauce is heated through again. Turn off heat and cover until ready to serve. Salt the boiling water well. Slide all of the ravioli into the water, egg side up, for 1 1/2 minutes. Stir gently but frequently to keep them from sticking together. Lift the ravioli individually from the water using a slotted spoon, drain quickly but well, carefully shaking off any excess water and transfer one to each serving plate. 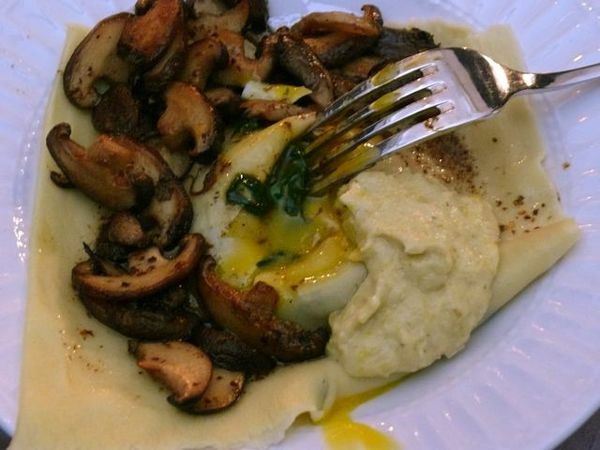 Toss mushrooms in the butter sauce and distribute mushrooms and sauce evenly over the servings. Stir the leek cream and add a generous dollop of it on the side of the ravioli. Dust each serving faintly with finely ground black pepper. Serve immediately. Okay, that looks and sounds delicious! I may just try that one today. tonight? just like that? im impressed!